T raditional style wool -and synthetic- flocked panels can bunch up, causing hot spots and uneven pressure. As time goes by, the shifting requires constant adjustments and re-flocking. AMS® System has been designed to allow a perfect union between horse and rider. This system eliminates hot spots by dispersing any pressure variances of the flocking within the panels, thanks to the exclusive pressure-stabilizing neoprene layer. The Neoprene layer will absorb impacts and distribute pressure evenly for maximum comfort and freedom of movement for your horse. Saddles with AMS® panels can be re-flocked and fitted to your horse, just like traditional wool-flocked panels. A SOFT and CONSISTENT panel making your horse more COMFORTABLE. 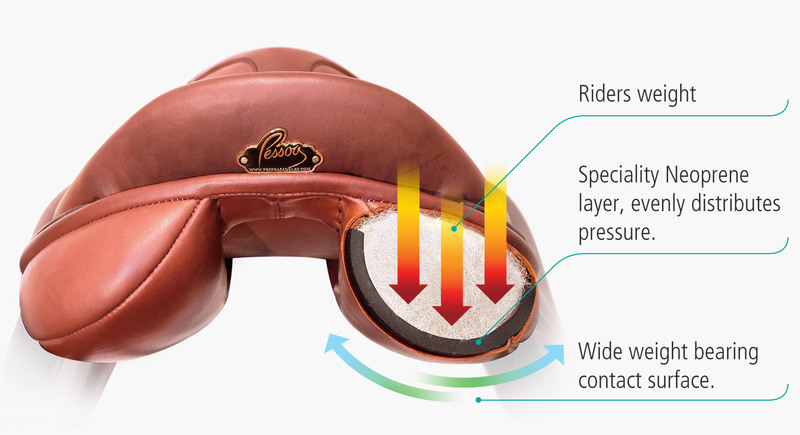 SHOCK ABSORBING properties from neoprene layer distributes pressure EVENLY across the horses back. 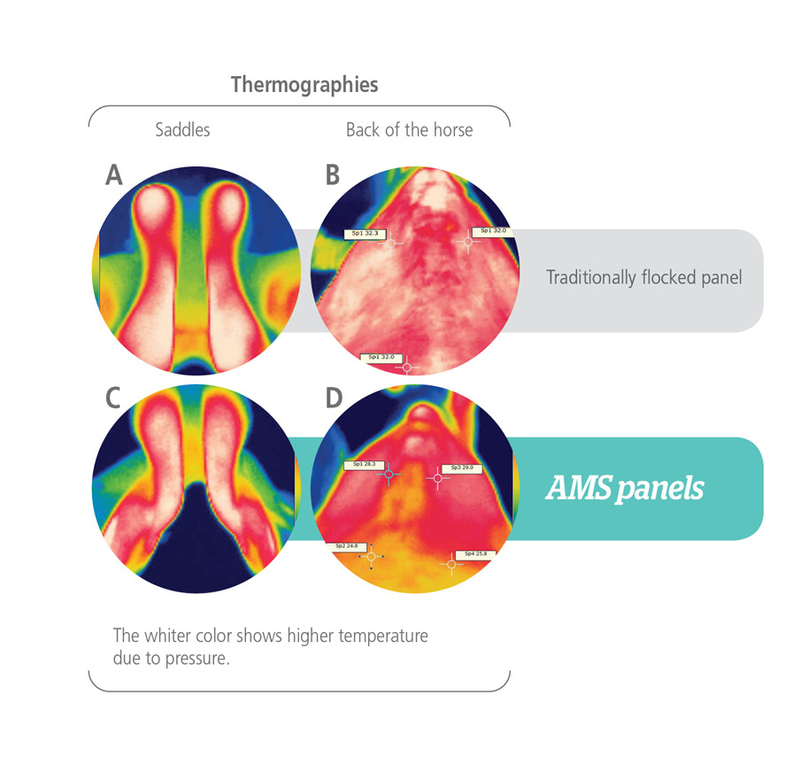 In order to compare the benefits of the AMS® panels, thermographies were carried out on the horse´s back, in a saddle with standard panels and another with AMS® after 30 minutes of identical exercises*. Diagram A shows clearly the unevenly on the pressure surface on a traditional panel due for the discontinuity of the white colour which shows a greater temperature. In the meantime the temperature on the horse´s back where this panel was used, shows a substantial increase and unevenly (diag. C). The stabilisation took up to three hours post-exercise. While for the AMS® panel (diag. B) the weight distribution without pressure points, it was uniform.And the same thing is proved on the horse´s back (diag. D). It took an hour in stabilizing temperature. The distribution of the weight of the AMS® System is more physiological, allowing a very adequate decomposition of the pressures on the horse´s back.